Specific allocated bullion refers to your ownership of specific bullion items such as bullion coins and bullion bars which are stored with BullionStar under your direct legal ownership, and where BullionStar is merely acting as your storage provider. When you buy uniquely identifiable bullion products from BullionStar and store this bullion in BullionStar's vault, you retain full ownership and legal title to the products that you have purchased. For example, if you buy two 100 gram gold bars for storage, you maintain full legal title to two identifiable serial-numbered 100 gram gold bars. The bullion products you own are inspected, photographed and stored under your legal ownership at BullionStar's vault at 45 New Bridge Road. With BullionStar's Vault Storage Solution, you can buy, sell or request physical withdrawal of your precious metals at any time. BullionStar is employing five different audit methods, one of which is to allow you to physically walk in to the shop in Singapore and do an inspection of your bullion. With the Cash & Bullion Dashboard, you can view, analyze and value your bullion portfolio online, in a number of different currencies. BullionStar's storage charges are very competitive and include 24/7 control of your bullion portfolio online, full insurance against all risks as well as third party auditing. 2) Bullion Savings Program (BSP) - Save or trade physically backed grams of gold, silver and platinum at a low premium and low spread! BullionStar's Bullion Savings Program is a unique savings and trading solution for physically backed gold, silver and platinum. BSP Grams are fully backed by BullionStar’s stock inventory of physical precious metals, and when you buy BSP Grams, you get a lower price premium than if you purchased individual gold, silver or platinum bars in small denominations. This makes the BSP program a cost-effective way to save towards physical bullion bars or to trade in and out of your BSP positions. A daily report of the gold, silver and platinum backing each of the three BSP programs is available to view each day here. BSP Grams can be converted into physical bullion bars without any charge, or sold back to BullionStar at any time. 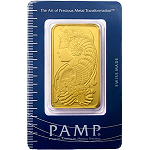 BSP Gold Grams can be converted in increments of 100 grams into 100 gram PAMP Gold Cast Bars. BSP Silver Grams can be converted in increments of 15,000 grams into 15 kg Heraeus Silver Bars. BSP Platinum Grams can be converted in increments of 1,000 grams into 1 kg Heraeus Platinum Bars. There are no fees for buying, selling or converting BSP grams into physical bullion bars. When you sell your BSP Grams, you also have the option of keeping the proceeds from your sell order on your BullionStar account to re-purchase at a later time. You can keep funds on your BullionStar account indefinitely and you can also withdraw your the funds at any time.